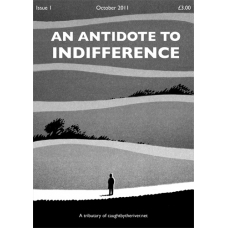 An Antidote To Indifference is Caught By The River’s first fanzine. Copied, stapled, dropped into shops and sold for less than the price of a pint. Some of the pieces have appeared on the site before, few are previously unpublished. As with here on the site, An Antidote To Indifference is all about the writing. Many of the writers who’ve contributed in the years since we started came to us with what they worried were bonkers ideas. In the vast majority of cases, we encouraged them to explore them fully. Whether those writers are old friends with new hobbies – like Nina Walsh, the girl we met back on the dancefloor at Shoom who now writes our allotment column – or new friends who approach us with brilliant ideas – like Guardian writer Jude Rogers who came to us with the idea of documenting her budding walking habit – didn’t matter. If they sounded feverish with excitement, 99 times out of 100 we were sold. In future, we’re hoping to give the fanzine over to the writers, letting some of our favourite contributors piece together their own best-ofs.